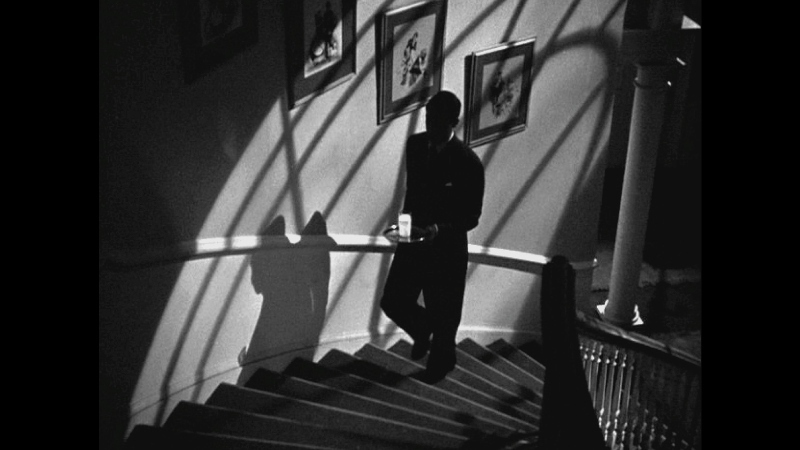 Loosely based on Frances Iles' 1932 novel Before the Fact, Alfred Hitchcock's Suspicion (1941) stands as an important entry in his formidable back catalog: it was an early venture into Hollywood filmmaking for the British director, the first which he also produced, his first of four collaborations with leading man Cary Grant, and his last film with Joan Fontaine (for which she won a Best Actress Oscar, though it was probably more deserved for her work on the previous year's Rebecca). This tightly-wound drama follows the dashing Johnnie Aysgarth (Grant) in his pursuit of Lina McLaidlaw (Fontaine), an unmarried woman from wealthy roots. He's well-dressed and charming, considered by many to be a prize catch, and it isn't long before they're married...but as the threads unravel from Johnnie's cool exterior, Lina begins to suspect that her fairytale marriage may have been a fatal mistake. 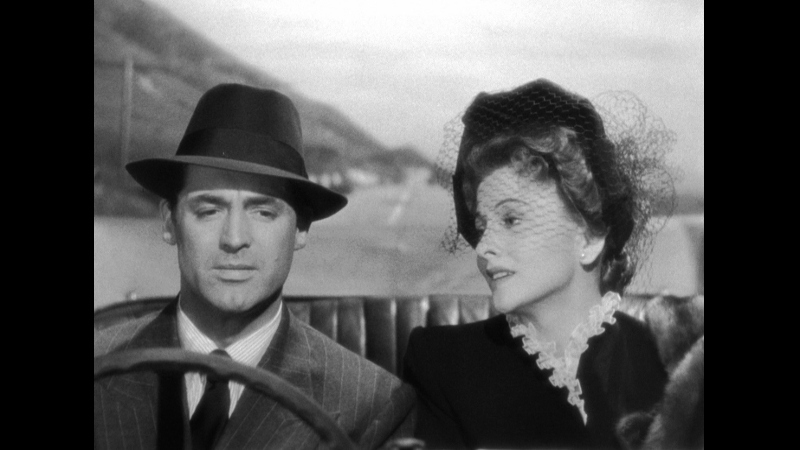 Much like Lina's new husband, there's a lot to like about Suspicion at first glance: Hitchcock puts a great deal up front, revealing little bits and pieces about Johnnie's true identity without giving everything away too soon. We quickly figure out he's less than honest about his savings account, personal habits (including an addiction to gambling), and possibly even his genuine interest in Lina. Grant plays against type as a man of questionable character, and his deception works fairly well because we want it to. From an acting standpoint alone, Grant and Fontaine play off each other perfectly; their performances alone make Suspicion one of Hitchcock's most immediately impressive films, even if it's much less known than later classics like Psycho, Rear Window, North By Northwest, and Vertigo. Still, it's tough to consider Suspicion as anything more than second-tier Hitchcock when you take the film's compromised ending into account (spoilers ahead, obviously). This 99-minute production isn't shy about depicting Johnnie's shaky moral compass: he's been a habitual liar for years, and there's nothing "real" about the image he portrays to Lina or just about everyone else. Close pal and house guest Beaky (Nigel Bruce) acts as a buffer for Johnnie's lies: they've known each other for years, far longer than the newlyweds have, so he's been conditioned to all the questionable behavior. Beaky is an important element of Suspicion's ability to string us along, as we don't want to assume Johnnie's "harmless" lies would ever lead to anything more serious. So when the obviously tacked-on ending---changed by studio demands---pulls the rug out by professing his innocence, we feel almost as deceived as Lina. 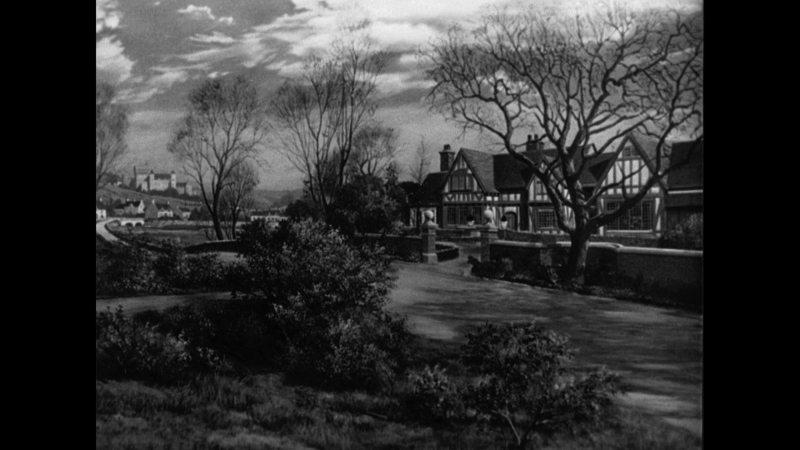 (Hitchcock's original ending hinted that not only was Johnnie a murderer, but he'd eventually be caught due to careful planning by his wife.) It's one time where the protective whitewashing actually has darker implications: in the "happily ever after" world of Suspicion, Johnnie is now free to continue deceiving the confused, silly Lina. Still, should what amounts to 90 seconds of nonsense destroy what Suspicion does so well? That all depends. First-time viewers might be turned off enough to prevent a follow-up, but those pulled in by the terrific performances and razor-sharp dialogue will soften over time if they haven't already. There's more going on here than what's on the surface, while the stylish visuals and slow-burning tension prove to be a winning combination. 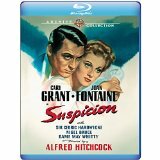 If the original ending were filmed, Suspicion would have a stronger reputation....but as it stands, it's still an enjoyable slice of classic Hitchcock that surprises in unexpected ways and holds up better than expected after 75 years. It also plays nicely on Blu-ray, thanks to a welcome new "Archive Edition" from Warner Bros. that aims to replace their own 2004 DVD. There's a lot to like about this 1080p, 1.37:1 presentation, as it stands well above Warner's own 2004 DVD in every department. This was obviously sourced from a new restoration: textures are stronger, image detail is more noticeable, black levels are excellent, and there's no flagrant dirt or debris to be found at all. Contrast levels are stable, film grain is present, and digital imperfections (excessive DNR, interlacing, compression artifacts, etc.) don't seem to be an issue either. Occasional moments of softness are present but not distracting, such as a few establishing shots and scenes filmed inside under low light. Without question, this is a strong visual presentation that fans and first-timers should appreciate, and the dual-layered format ensures this 99-minute film gets plenty of breathing room. Not surprisingly, the DTS-HD Master Audio track (presented in 1.0 mono) does what it can with the source material. Dialogue is clean and crisp, background details are balanced nicely and the score rarely fights for attention. The only potential drawbacks, such as a thin high end and modest dynamic range, are likely due to the original elements. Anyone familiar with films from this era should know what they're getting and, in that respect, Suspicion won't disappoint at all. Optional English subtitles are included, as well as French and Spanish dubs in Dolby Digital mono. Everything (read: not all that much) from Warner Bros.' own 2004 DVD, which includes the mid-length retrospective featurette "Before the Fact: Suspicious Hitchcock" (21:34) and the film's Theatrical Trailer, which still looks as rough as ever. The former extra doesn't go into massive detail but covers the basics nicely, from Hitchcock's original ending that was scrapped after studio interference to the film's misguided colorization during the 1980s. It's not surprising that we don't get anything new, but at least these brief but interesting bonus features have been ported over. 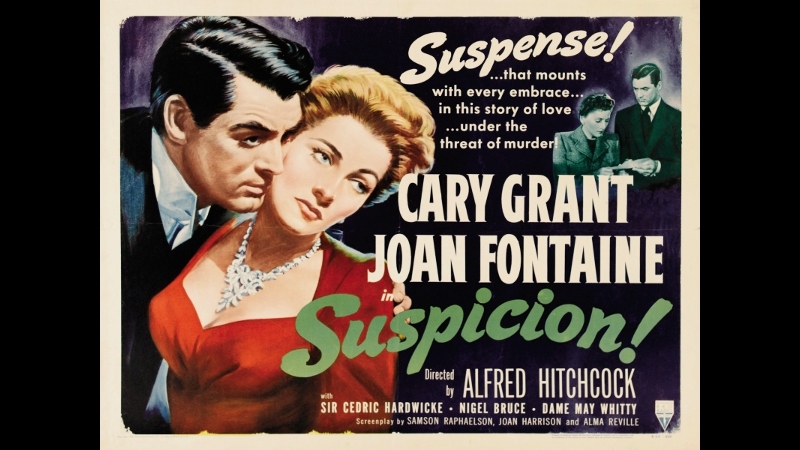 Despite its relatively meager plot (at least by Hitchcock standards) and compromised ending, Suspicion remains an underrated entry in the director's formidable back catalog, serving up plenty of suspense, atmosphere, and terrific dialogue from start to almost-finish. As one of his early ventures within the Hollywood studio system---and the first in which he served as director and producer---it's a lightweight but enjoyable film with more replay value than expected. Warner Bros.' welcome "Archive Edition" Blu-ray easily outpaces their own 2004 DVD, serving up a solid A/V presentation and the limited extras from that older disc. Relatively new fans shouldn't consider it the best entry point, but it's still an above-average production that holds up just fine 75 years later. Firmly Recommended.